In our ongoing look at the demise of Sears, which once dominated the retail landscape in Canada, business reporter Jeff Buckstein looks at the failure of Sears' online strategy. 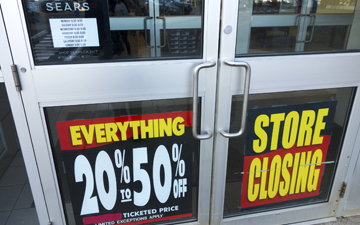 OTTAWA, Dec. 4, 2017 – In the future, when business and management accounting students study the demise of Sears in Canada, will they note its failure to adapt to the digital age? In addition to the changes taking place in Sears' traditional, bricks and mortar stores, the company was never prepared for how quickly online retail blossomed, beginning in the 1990s. Companies such as Amazon.com were able to establish a reputation for convenience, providing consumers confidence that they could buy something online — say, during the evening, and the product would show up at their door the next day, says Barry Cross, an assistant professor and distinguished faculty fellow in operations strategy with the Smith School of Business at Queen’s University in Kingston. “By the time Sears got comfortable with that model and the way that people were behaving, Amazon and players like them had already started to shape the online experience. So it was late and not enough. Even when they started providing online sales, the products were being delivered to a Sears store, so you had to go in and pick them up,” Cross adds. David Zietsma, a customer experience consultant with Jackman Reinvents in Toronto, and a former vice-president of strategy at Sears from 2012 to 2014, says Sears earned a lower margin from its online products than those in its stores because customers were only going online for opportunistic buying. “The customer was buying online only when things were on sale. There was no real experience created. Just based on volume of product on the website, and as a result of aggressive pricing, Sears sold a lot online. But that doesn’t mean they were well positioned to hold ground in the digital world,” he elaborated. Sears’ problem in terms of its ability to adapt was more fundamental than adapting from brick and mortar to online. They needed to adapt to changing consumer behaviour and needs, but Sears was just pushing the same old model, offering many products and using promotions to do so, says Zietsma. “That just doesn’t fly anymore. It’s not enough,” he stresses. But the Sears online experience, including an interface with too many steps required to make a purchase, wasn’t easy. “I remember I ordered mattresses online, and they were being shipped to one of the Sears outlet delivery locations. They never showed up. I called that centre, and they said ‘we had no tracking of the package,’” says Zietsma, adding that he even worked at Sears at the time. The retail stores that continue to be profitable businesses today are those that have focused more on items like apparel, footwear and housewares, and moved away from things like appliances and electronics, which are being offered in other outlets that provide better customer value, like a Best Buy, Bed Bath and Beyond, and Home Outfitters, says David Soberman, Canadian national chair in strategic marketing at the Rotman School of Management at the University of Toronto. Moreover, the product lines offered by different types of stores are now being blurred with a company like Loblaws expanding into apparel, and Wal-Mart expanding into groceries, making it even more difficult for Sears to compete. “That’s okay if you’re in a small Canadian town where you’re the only game in town. But when you’re in Toronto where people have multiple choices, you’re going to find that you’re not doing well,” says Soberman. “Clearly what happened is in the places where they faced competition, which were, I would say, major metropolitan areas [with] more than 100,000 people, Sears was becoming an unattractive choice,” he adds. Online businesses have put a lot more pressure on bricks and mortar retailers in the last five to ten years. “But if you find the right formula, then it doesn’t matter. [For example] a lot of the stuff that people are buying at Costco, they’re not going to order online,” says Soberman. Moreover, Costco also has a strong online presence, which is ideal. “You want to have those two things coordinated,” he adds. Later this week, we look at the inventory and operational issues behind the demise of Sears. Jeff Buckstein, CPA, CGA, is an Ottawa-based business journalist.